I must admit I was a little skeptical at first. I’m not too good at meeting new people. My daughter uses the term “socially awkward” and I’d say that about sums it up. But my good friend and neighbor talked it up to me and I finally consented. The meetings were only every 2 months so that was doable. With the baby I have to be very choosy with my outings. I’ve been to 4 or 5 now and I’m finally feeling comfortable and smiley. It’s nice to take myself to dinner and talk adult with intelligent women. So this last meeting it was my turn to pick our book. We don’t have rules or themes. We’d last read “The Night Circus” which was awesome. 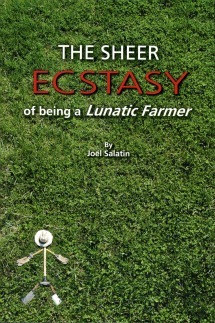 I could have picked any number of books but I chose to go with “The Sheer Ecstasy of Being a Lunatic Farmer”. We do love our Mr. Salatin around here. I had a feeling it could be a great discussion about local food politics and normal food in general. I’d read it already of course. Joel is close to sainthood in this house. But I wanted to read it again so I’d be fresh for discussion. Everything read so far in book club has had topic questions attached. The person that chooses the book also leads the discussion. I thought I’d find questions easy for this book. Nope. Nothing. I scoured the internet and came up with zilch. So about half hour before dinner (a bit last minute) I just wrote down some questions that popped into my head. I’ll include them here just in case someone else decides they need to discuss this book (or any of his books really). Maybe they’ll stumble this way and let out a sigh of relief. I know I would have. So I left happy and content that I could share some of Joel Salatin’s wisdom. They all said they would eventually read the whole thing. But even if they never do, the choice was a winner for all. 1. Do you believe we are what we eat? Do you think this extends to the well being of the animal? 2. Do you find Joel’s views too extreme? 3. How much food is in your pantry? If shut down, how long would your food and water last? 4. What do you think we as consumers could do to have more control of the food system? What change would make a most noticeable difference? 5. How do you feel about CAFO? Are you in favor? Compare to Free-Range open farming method. 6. How do you feel about the cost of normal food? Too high? Affordable? What would you give up to eat better? 7. How many meals out of ten do you make from scratch? 9. What’s your take on GMO’s? 10. How important does food factor in your life? 11. How much role do you think the government should have in our food system? 12. Do you agree with his statement about the world having enough food? 13. “With knowledge comes responsibility.” What does this mean to you in relation to food? 14. Was this an easy read or a hard read? And has it changed your views on how you eat? This entry was posted in Brandi's Journal, Homestead How To, Urban Farming and tagged colorado springs blog, colorado springs sustainability, green living, homesteading, Joel Salatin, Polyface Farms, self-sufficiency, The Sheer Ecstasy of Being a Lunatic Farmer, urban farming. Bookmark the permalink.